In the latest blog posting in Inside AdSense, Arlene Lee of Google AdSense Publisher Support has clarified the official stance and police of AdSense program towards the popular walking on the tightrope practice of putting images or graphics next to or immediately beside Google AdSense ads block. The updated policy stated that publishers cannot line up images and ads in a way that suggests a relationship between the images and the ads, even if there is a small space or a line between the images and ads. It’s believed and proven that the method of placing images next to and inline with the ads block will tremendously increase CTR (click through rate) of the AdSense ads, sometime even up to 100% or more. Higher CTR will indirectly increase the CPM rate of ads, making the publishers more money from the AdSense program. Some smart developers and publishers even create automated tool such as AdSense Beautifier that automatically align your AdSense ads with rotating images which inducing more clicks from surfers. Previously, Google AdSense has an ambiguous stance or policy on whether such as practice is allowed or not. Google at one time also displayed image besides ads units in an ads block, adding euphoria to the publishers that images beside ads is silently consented by Google, although AdSense program policies clearly stated that any method that artificially generates clicks or impressions is strictly prohibited. However, note that Google only wants to stop usage of images that suggests a relationship between the images and the ads next to the ads. Which mean, using a totally unrelated images may still be allowed. 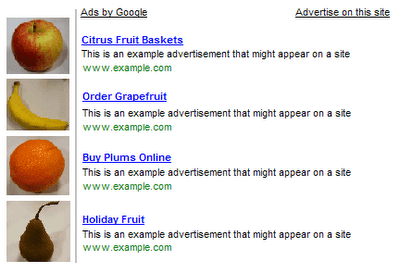 To be safe, either don’t use the images next to ads trick, or email Google for permission. Beside the images that placed beside the ads, ads placement that too much integrated into with the structure of the sites that people could find misleading are also banned.